As I mentioned in a previous post, I will on occasion be talking about what I’m reading these days. In this case, it’s not a comic book. I just finished two of Isaac Asimov’s novels and a couple of his short stories. I had already read his original “Foundation” Trilogy and decided to try the fourth book in the series. The original three books were written early in Asimov’s career, starting with “Foundation,” published in 1950, if memory serves. 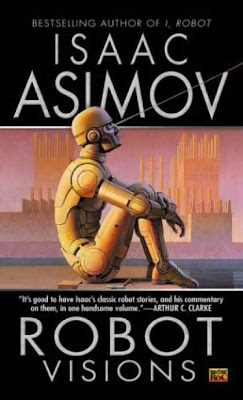 The immense popularity of the series meant that fans for 25 years continued asking Asimov to write more. Finally, in 1982, “Foundation’s Edge” was published. This is the book I just finished and something really remarkable happened in it. Not only was it a riveting read but it also manages to merge his “Foundation” universe with his Robot Universe. 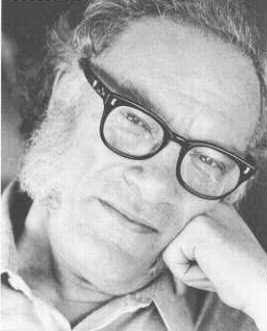 Asimov is best known for three “universes” that he created. The Foundation one, the Robot one and the Empire one. Three distinct kinds of stories set in three different universes. Asimov’s three “Empire” novels were all published in the early 1950s as well. And his first Robot stories were published around the same time (mid-40s, I think was his first published Robot story). Anyway, the point I’m getting at is that this book did something with continuity (a comic book buzz word if ever there was one!) that I found really interesting. 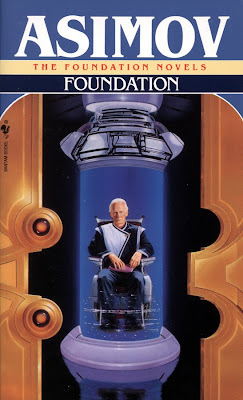 “Foundation’s Edge” managed to merge two continuities together in such a way that as a reader, I did not feel that I missed anything by not having read Asimov’s Robot novels or short stories before hand. I did read most of the short stories about 15 years ago, but there was nothing in them that I needed to know for reading “Foundation’s Edge.” Nor did it feel like they were being forced together in a strange way. As an aside, I found myself thinking about DC Comics acquiring the rights to Wildstorm or the Charlton characters. And it occurs to me that there is a way to bring the Wildstorm Universe into the DC Universe without causing much confusion or alienating readers. It’s not my place to go into it here, but I think it could be done if DC and Wildstorm agreed that that was something they wanted to do. After finishing Asimov’s novel, I did a little research online and found some of Asimov’s statements about merging the two universe (ultimately, he merged all three) and he admits that certain facts and dates will not line up properly and that there are some inconsistencies, but he overlooks it as he is aware that they are all fiction. One of the things that I admire about Asimov’s work and seemingly his approach to it, is that it appears to be a living and breathing thing to him—constantly evolving and growing. In his book “The Stars, Like Dust” (the first “Empire” novel chronologically, though the second one written) he has an afterward. The novel was published in 1950 but the afterward was written in 1982 and explains that science has evolved since the 1950s and that our scientific knowledge in the 1980s makes one of the planets in the book a most unlikely kind of planet to find—he’s got the atmosphere all wrong. What’s remarkable to me about this afterward is that Asimov thought enough of his readers and of his work to put it in the book in subsequent printings. He didn’t finish the book in 1950, he didn’t finish it in 1982. He never finished it—never stopped thinking about it, learning about the science that he researched so heavily to produce the work in the first place. And he has the humility and professionalism to own up to something that is wrong. But he also has the professionalism to own up to it, but leave the work alone. He did not rewrite the book as the new evidence would suggest he do. He recognized that it was the best it could be at the time of its writing. (Totally on an aside here, but I really wish George Lucas would learn this lesson—sigh). Asimov’s approach to co ntinuity is that it is something that can bend and change and grow and that it should not get in the way of telling a great story, which “Foundation’s Edge” really is. I can remember hundreds of conversations about continuity while editing at Marvel Comics. And I have them here at IDW. And yes, it is important. But it is important to remember that continuity comes from story, and that story does not come from continuity. Continuity is there to serve and grow from the story. And in the case of ongoing stories or universes, continuity will change and evolve. It has to, because these are not real events and, if for no other reason, simple mistakes will be made. But continuity must always come second to story. As a counter-point to the above, continuity can bend, but it can also break, and so I am not suggesting that major events in the lives of characters just be arbitrarily ignored, but a great story that comes from character, can find a way to maneuver through continuity—and if it can’t, then it is either not a great story, or the continuity is too cumbersome. And maybe it’s the comic book geek in me, but seeing the two continuities merge in “Foundation’s Edge” has made me pick up more of Asimov’s books. I’m now reading the “Empire” novels and will read the few Robot novels and stories I haven’t read to catch up to where I am in the “Foundation” series before I read the next “Foundation” book. Yeah, I’m a geek like that. And I learned to be a geek like that from comics.